Streptococcal species are the second most common cause of native joint septic arthritis (SA). However, there are few systematic data about streptococcal SA. The medical records of adults with SA caused by streptococci, pneumococci, and enterococci at our tertiary care centre between 2003 and 2015 were reviewed. 71 patients (34% female) with 83 affected joints were included. Median age was 62 years. A single joint was involved in 62 patients (87%). One or more comorbidities were present in 58 patients (82%). 16 patients (23%) had a concomitant soft-tissue infection overlying the affected joint. The hematogenous route was the dominating pathogenesis (42/71, 59%). 9 (13%) patients were diagnosed with endocarditis. The knee was the most commonly affected joint (27/83, 33%) followed by shoulder (13/83, 16%). 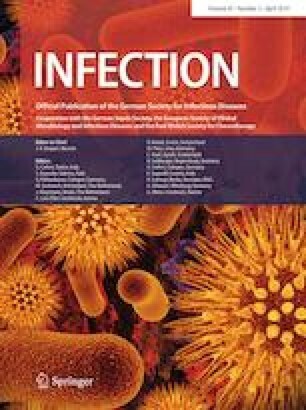 ß-haemolytic streptococci were most commonly identified (37/71, 52%) followed by polymicrobial infections (12/71, 17%). Surgical interventions included arthroscopic irrigation and debridement in 31 (44%), arthrotomy in 23 (32%), and amputation in five patients (7%). Median duration of antimicrobial therapy was 42 days. Antibiotic treatment without any surgical intervention was performed in 5 (7%) patients. Outcome was good in 55 (89%) patients; mortality was 13% with four of nine deaths attributed to joint infection. Age and pathogen group independently predicted poor outcome in recursive partitioning analysis. Streptococcal SA was mostly due to ß-haemolytic streptococci in older and polymorbid patients. Old age, anginosus group streptococci, enterococci, and polymicrobial infections predicted poor outcome, while antibiotic treatment duration can likely be shortened. This work was presented in part as an oral presentation at the 27th European Congress of Clinical Microbiology & Infectious Diseases 2017 in Vienna (OS026). Helene Lotz and Carol Strahm have contributed equally to this work. The online version of this article ( https://doi.org/10.1007/s15010-019-01301-w) contains supplementary material, which is available to authorized users. The conception and design of the study: HL, CS, and WCA; acquisition of data: HL and CS; analysis of data: HL, CS, and VZ; interpretation of data: all authors; drafting the article: HL, CS, and WCA; critical revision of the article: all authors; final approval of the version to be submitted: all authors. The study was approved by the local Ethics Committee (EKSG 15/161). Due to the retrospective nature of the study, an informed consent was waived.